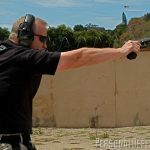 The Multiple Backstrap System (MBS) allows shooters to better adjust the Gen4 pistols to their hand size. All Gen4 guns come with the newer version of the RTF grip texture. The U-notch rear sight is extraordinarily durable and will survive much longer with this system than pinned ones. The cutout in the top of the slide reduces weight, offering excellent balance in the 8.15” long G35. The new recoil system is a real game changer for the Gen4 pistols. However, it is much larger than the older system and cannot be retrofitted into older, Gen3 guns. Shooting was easily manageable. The G35 allowed for better recovery between shots and faster follow-up shots downrange. 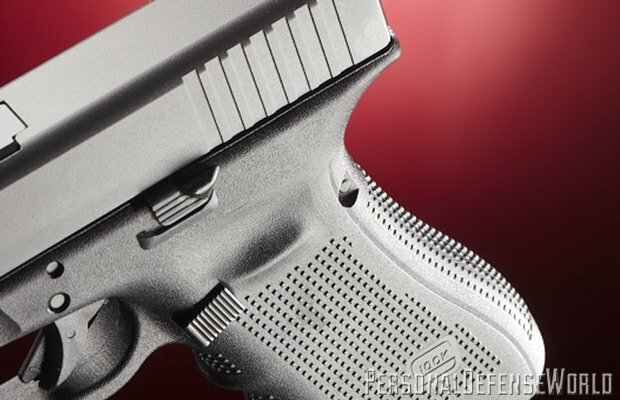 Glock’s 4th Generation or “Gen4” guns have made quite a splash nationwide. 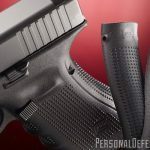 These weapons have brought new life into the Glock line, offering more options than were previously available for law enforcement and civilians alike. 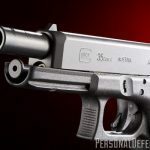 As the Gen4 version was moved into the different lines of the Glock family, they have been both highly anticipated and praised. 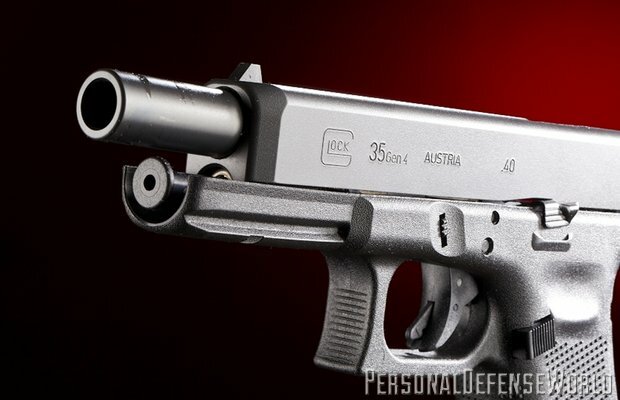 Now Glock Gen4 has come to one of my personal favorites, the Glock 35. 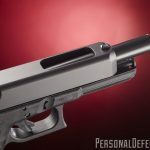 These longslide .40 S&W pistols are made to bring the slide length of tactical pistols such as the 1911 into the tried-and-true duty gun design of the Glock .40s. 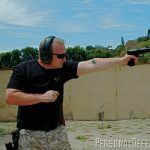 The Glock 35 has been the choice for issue of at least two separate departments in Southern California, and is accepted as a duty gun in almost all the others if you wish to buy it. 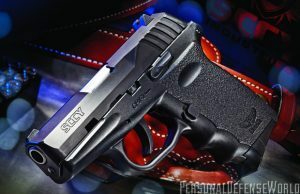 I personally love the longslide as a carry gun on and off duty. 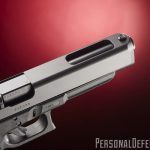 With its 5.3-inch slide with the characteristic cutout to the top of the slide behind the muzzle, the balance is excellent and reminds me of the 1911s I used to own. 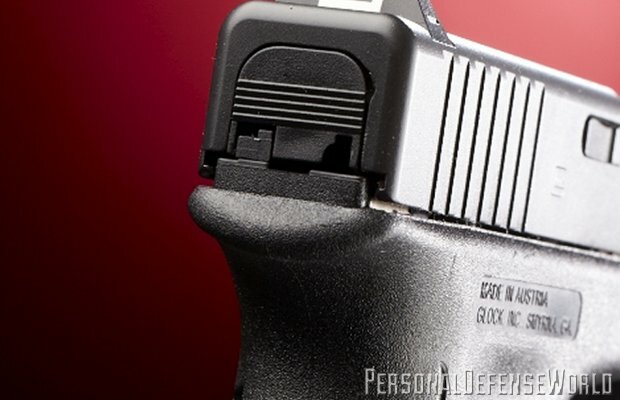 A couple of months ago, I had a chance to try a Glock 35 Gen4 that the local Glock representative brought recently to our range and really enjoyed it. On a fluke, I called my local “cop shop” and asked if they had one. Sure enough, he’d just received one in stock, and I broke a few speed records getting in there to put my money down. 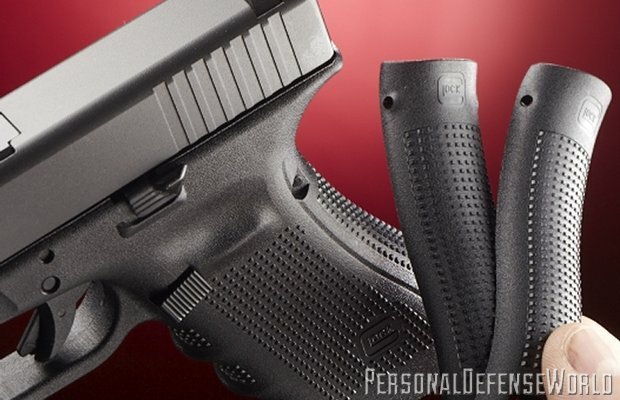 The Gen4 version of Glock pistols addresses some options wanted by shooters. 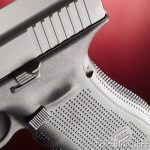 First off, you’ll notice the Rough Textured Frame (RTF) surface on the grip of the gun. 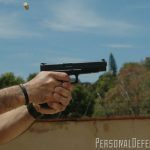 This gives the shooter a positive hold onto the pistol in the worst of conditions. It’s ideal for people who work in conditions such as marine environments or wherever you’re likely to get wet. More importantly, the grips of all Gen4 guns use the MBS (Multiple Backstrap System) that allows the gun to be better adapted to the shooterâ€™s hand. 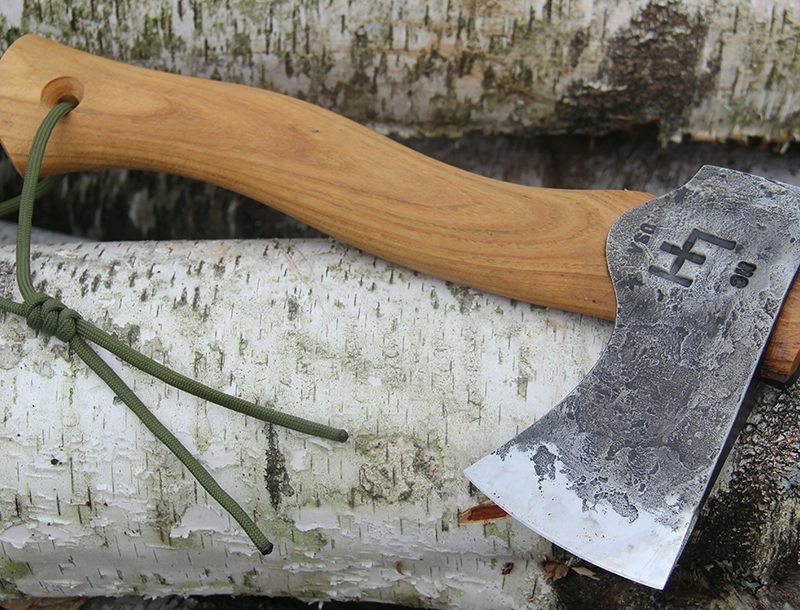 The gun comes standard with a â€œshort frameâ€ shape to the grip, a medium back-strap insert, and a large backstrap insert. Another addition is the reversible magazine release, granting the ability to switch the release for right-or-left-handed shooters. 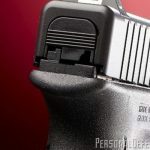 This again makes the gun more adaptable to left-handed shooters who, up until now, have had to learn to use their trigger finger to release the magazine when shooting. Now it can be a true left-handed gun with the switch of the release. The new magazines are also made with ambidextrous cuts to be useable with either side magazine release. The most important innovation in my humble opinion is the addition of the new recoil spring system. I say “system,” as it uses multiple springs over a rod and plunger-like system, just like the Glock 26 and 27. This spring setup allows the recoil to be better absorbed and will last longer. 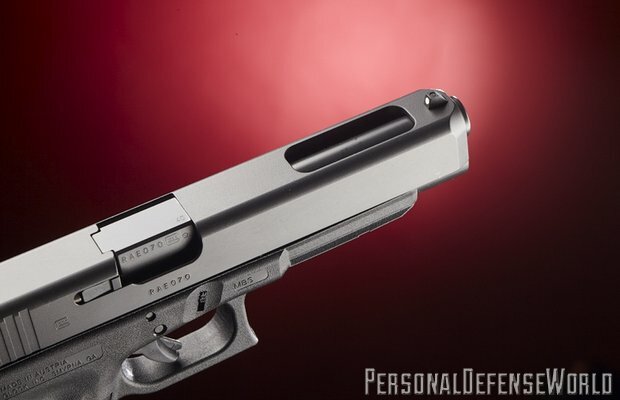 I have heard recommendations from some to change out the recoil spring assembly every 1,500-2,000 rounds on the older Gen3 handguns in .40 S&W. 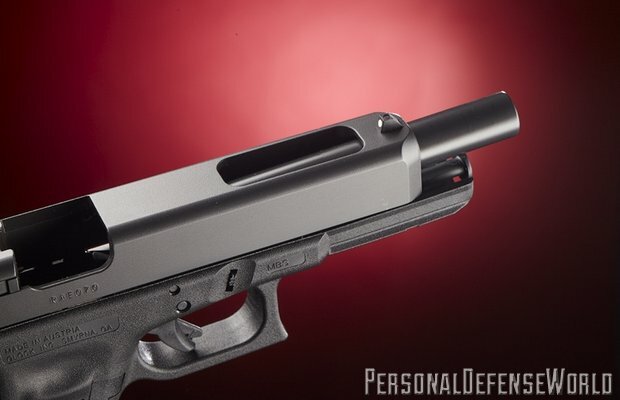 The Gen4 will last over twice as long as they suggest every 5,000 rounds. I felt it, but not so rough as it was uncomfortable during firing. Moving to the backstrap groove, I put the “M” or medium panel on, as it’s identical to the Gen3 profile I am used to. I was a little concerned how the inserts would feel, since it’s just an additional panel to the back of the grip. However, once attached by the clip on the bottom and the trigger-housing pin at the top, it was very solid. Then I saw the front of the gun and realized why the Gen4 recoil system will never be something you can just retrofit on an older gun. The recoil assembly is noticeably wider and the hole in the front of the slide was almost twice as wide as the earlier model. When looking at the front of the gun, it was almost like looking at an over-and-under barrel setup. Fit and finish on the metal is a somewhat duller-looking business: black, compared to the more slick, Teflon-like shiny finish seen in recent years. Other than that, it’s the same deadly serious-looking pistol we have come to expect from Austria. I immediately replaced the factory sights with a set of Heinie Straight Eight sights. 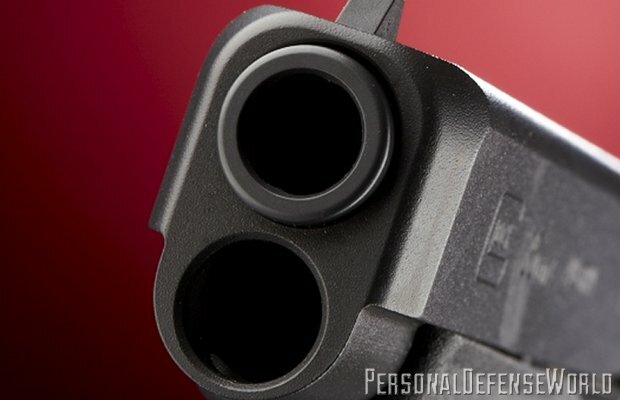 They give a unique sight picture with a tritium dot on the front sight you place above a single tritium dot in the center of the rear sight’s creating an “eight” with the aligned dots. The indoor range allowed for a good place to try the weapon in a relatively controlled environment. I brought Win-chester Ranger 180-grain JHP, Winchester White Box 180-grain FMJ, and last but not least, some Federal 180-grain HST. All in all, I put over 300 rounds through the gun in a relatively short period of time. I didn’t do any cleaning or tear down of any kind between strings of fire. Sure enough, this Gen4 lived up to Glock’s reputation of reliability. There was not a single malfunction of any kind. 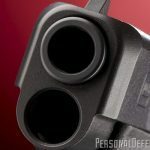 Every round chambered and fired reliably. As for accuracy, the G35 was dead-on accurate. Shots landed squarely at 12-o’clock, which meant that if I “lollipoped” the target like I do with my AR sights, putting the top of the sight directly under the desired impact point, it was perfect at 7 yards. Once the Heinie Straight Eights were on, I was making headshots at 25 yards consistently. I don’t know if the accuracy is a result of the longer barrel or the longer sight radius; regardless, the G35 offers excellent accuracy potential. The new RTF texture offered good traction while shooting, and is an improvement on the earlier RTF2 texture that was a little too aggressive. The Gen4’s RTF is a bit more friendly to the shooter’s skin. The ambidextrous magazine release is oversized, and was easily pushed to eject the magazine while shooting. The most impressive improvement I saw in the Gen4 is the recoil spring assembly. I won’t say that the recoil in the Gen4 is less than the recoil of the Gen 3’s, it’s just different. 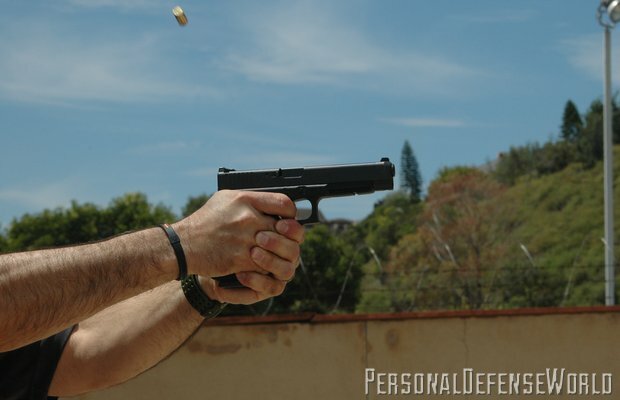 The powerful impulse of the .40 S&W is usually snappy with a good amount of muzzle rise. 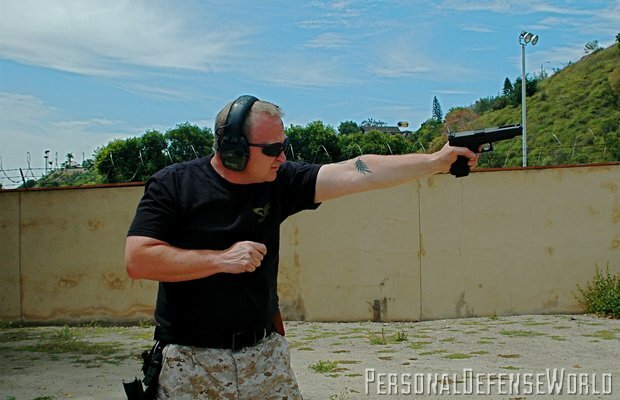 The Gen4 makes the recoil more straight back with much less muzzle flip. This makes the recoil feel less snappy overall, and allows for much quicker follow-up shots. Once you work into the gun, I found triple-tap strings of fire easy to con-trol. Overall, the gun was far less snappy than any Glock .40 I have shot thus far. Like any Glock, this gun pointed naturally. 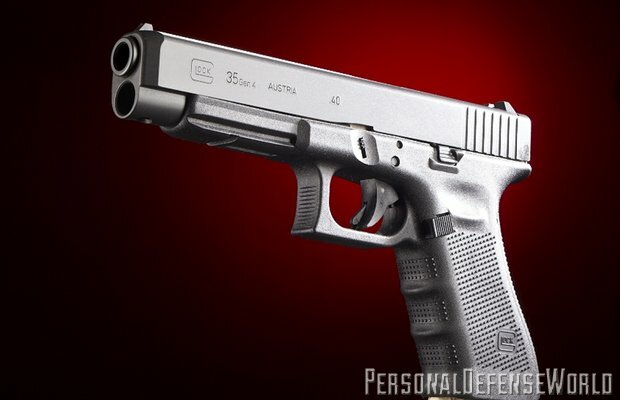 However, the Glock 35 points exceptionally well due to the balance of the gun. These weapons were meant to tame the .40 S&W and shoot accurate, rapid shots. 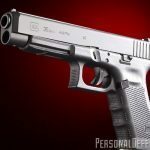 I know this gun was originally aimed at the competition market, however, this gun is an ideal weapon for combat based upon all the qualities that make this Glock exceptional. Yes, I’m a pretty big fan of this design. 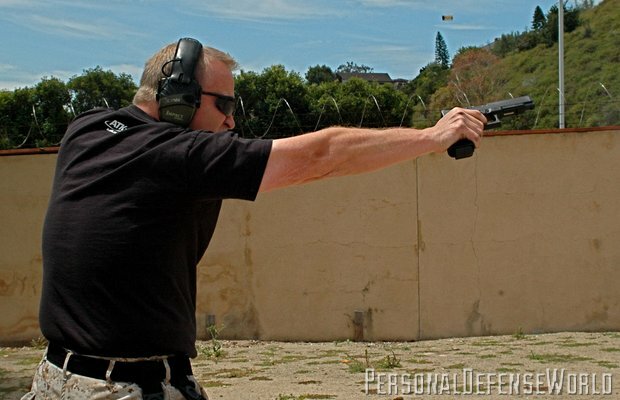 Consider the Gen4 an option for those who want the better ability to adapt the gun to an individual. 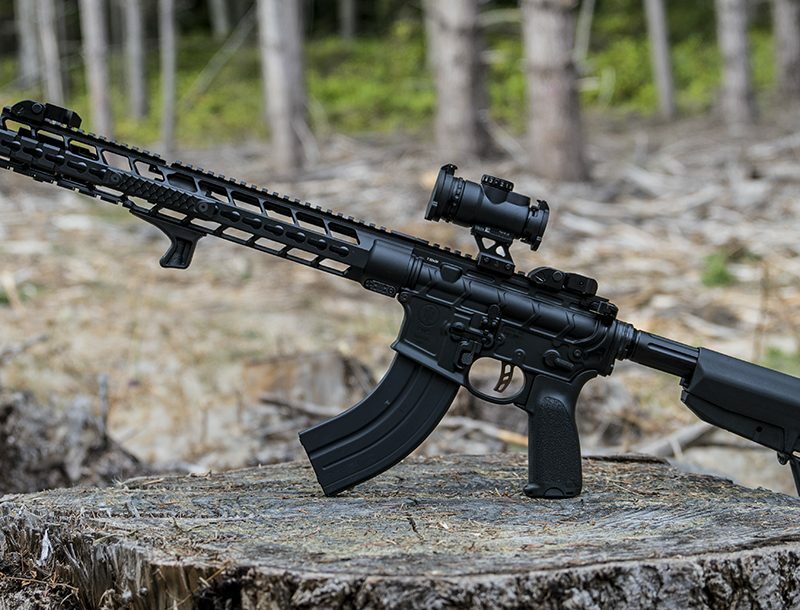 It also has a recoil system that will need less replacements, which means overall less battering of the frame, which then translates into less wear. Then again, it is rare when you ever hear of a Glock wearing out. 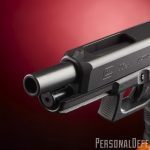 Moreover, for those who are recoil- sensitive, this generation addresses .40 S&W caliber head on with a spring setup designed to deal with that caliber. I liked it enough to fork out some dough and buy one for my duty rig. I like the longer life of the recoil assembly, and the new grip surface. There is nothing like the feel of these longslide Glocks. 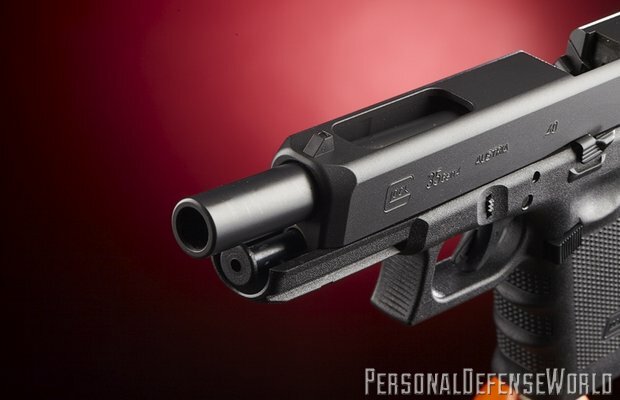 Overall, this is an excellent weapon for those who want their â€œPractical Tacticalâ€ Glock.